foreign or different from what they are used to. LAMPA System (Linux, Apache, MySQL, PHP, Asterisk) into a world class PBX. done the way they are. these FreePBX Users (AMPUSER) vs. devices vs. extensions. for the rest of this article. extension into at least 3 chunks of information. provisioning file or nonvolatile memory. 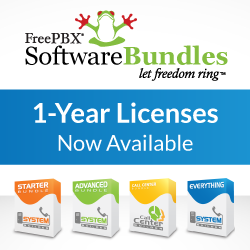 in this case, the FreePBX Users and Devices. logged into by different users such as the hot desk example. an adhoc device is currently assigned to. CallerID which may be from a different country. that device by going to the Asterisk CLI and typing database show DEVICE/320. user/extension with its corresponding device(s) at any point in time. masquerading their internal caller id. All devices that are currently associated with this user. For example, if the user had devices 1320 and 2722 then the entry would be "1320&2722"
inbound/outbound calls or disallow them, or allow On Demand recording. made when an Endpoint originates a call. dialplan is to call Macro(user-callerid). used and any other configurations for this user are known. End Points for those devices by looking up the dial field in each of those DEVICE objects. what other parts of the system you may wish to hear more about next. Next PostFollow Me or VmX Locater™ – Which One is for You?